Let’s get this out in the open: I love owls. And when I say that I love owls, I mean that I’m well on my way to becoming a crazy cat lady – just replace the cats with owl things! Needless to say, when I set foot on the show floor of the 2012 Craft & Hobby Association Summer Show in Rosemont, Illinois, I couldn’t wait to see if owls were still making their mark in the crafting world. I’m happy to report that they are! I saw so many adorable owls this year that I thought it would be fun to feature a nice little round up for you all. 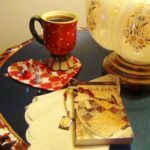 Make sure to read until the end; I’ll also be including information about our exciting Swag Bag Giveaway! Want to see more trend posts? Read about all the other trends our team spotted at CHA right here! Cosmo Cricket Owls – This adorable owl print is part of a new collection from Cosmo Cricket called S’more Love. Pair this owl shape with their Life’s a Hoot stamp and you’ve got the perfect Thinking of You Card! Stampendous Steampunk and Halloween Owls – With steampunk and vintage crafts being so hot right now, it was only a matter of time before monocles, old gears and goggles found their way onto our feathery friends. In some new designs by Stampendous, owls meets steampunk meets Halloween and it’s … stupendous! Even if you’re not a fan of the steampunk trends, you had to admit that owls in top hats and bow ties look surprisingly sophisticated. Don’t you think? Silhouette Owl – Even Silhouette is hopping on the owl bandwagon. This wide-eyed little guy is hard not to love; you could even say he’s hypnotic. For more insanely cute ideas from Silhouette, check out this baby shower card. Spoiler: it includes cute owls. Hero Arts Owl Stamp: In case you thought owls were only for Halloween or steampunk enthusiasts, think again! This festive stamp is perfect for all your Christmas crafting this year. Even if you don’t enjoy making your own cards, just throw this owl stamp on the back (or front) of your card envelopes for an added touch of cuteness. Don’t forget to check out our complete coverage of this summer’s CHA show. You’d didn’t think we’d go to CHA Summer 2012 and not bring back something for all of our lovely readers did you? 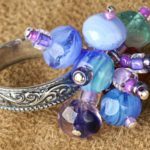 We went to the Craft and Hobby Trade Show like we do every year and collected all the swag we could into a large CHA Swag Bag Giveaway! 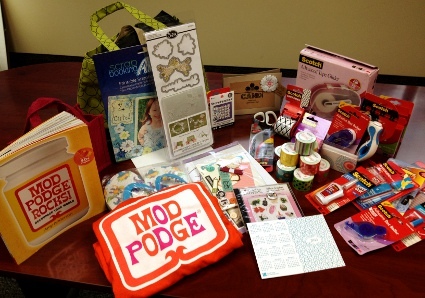 We picked up some awesome prizes from Mod Podge, 3M, October Afternoon, and so much more! So don’t hesitate! Enter today by answering the question below in the comments section. 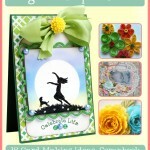 Contest closes Sunday, July 29, 2012 at 11:59p CST. Please comment on any of the Summer CHA 2012 blog posts to enter. Winners will be posted on FaveCraftsBlog.com and notified by email. 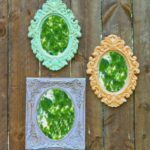 What’s your favorite crafting trend? And now on with the updates! I know we’ve all been busy knitting for charity, but I wanted to make sure that I showed you how many generous donations we’ve received so far. Thank you so much to everyone who has participated so far! We have so many kind, generous and talented readers! Seriously how cute is that bear scarf set! There’s a hat in there too. 🙂 And look at this cute cupcake hat! Adorable! Thank you again to everyone who has sent us donations so far! Remember, we’ll be collecting items on behalf of Project Winter Warmth until Nov. 28. After that we’ll choose one lucky winner to receive a $50 prize basket from AllFreeKnitting just for participating! All donations will be delivered to Breanna after Nov. 28 and will be distributed to various charities, mainly the Meals on Wheels program, The INNs Homeless Program, and any local schools where children are in need of these winter items. There are no yarn or pattern requirements for these donations – use whatever you have on hand! Need a pattern? 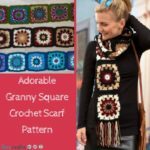 We have tons of great charity patterns on AllFreeKnitting and AllFreeCrochet. Editor’s Note: Thank you again to everyone who participated in Breanna’s project. Please note that we are no longer accepting donations at the office, as the project has ended for this year. Thank you! Attention all knitters and crocheters: I have an exciting opportunity for us all to give back – it’s called Project Winter Warmth. From now until November 28, Project Winter Warmth will be collecting knit and/or crochet hats, mittens/gloves and scarves for those in need. Donations are needed in all sizes (newborn, adult and children) and will benefit charities in desperate need of these items, mainly the Meals on Wheels program, The INNs Homeless Program, and any local schools where children are in need of these winter items. There are no yarn or pattern requirements for these donations – use whatever you have on hand! Project Winter Warmth was started by Kenosha high school student Breanna Ricchio (pictured below) who has a passion for helping others. Breanna, along with her teammates on the Bradford High School Girls Varsity Soccer team, hopes to collect enough handmade sets to donate to all of the charities listed above. When Breanna contacted me a few days ago, I was so excited to help her get the word out about her great cause – she’s from my hometown Kenosha, WI! Breanna started the Winter Warmth Project through the encouragement of her mother. “My mom has always done a lot of charity work and I always tagged behind to help her … She mentioned I should try something on my own. This is the idea I came up with. It’s great my coach and fellow team mates are going to help me out,” she said. As a special treat: For everyone who sends us a donation, I’ll enter your name into a special contest for a prize package from AllFreeKnitting. We gave away a $50 prize basket for our last charity challenge, so I promise it will be good! 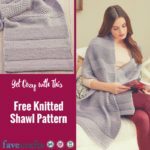 Remember, you can use any pattern you would like, but here are a couple of our favorites from AllFreeKnitting.com. We also have plenty of free patterns for scarves, hats and mittens/gloves to choose from! Mother Bear Charity Challenge: Recap and Winner! First of all, Happy I love Yarn Day! Now, for the past few weeks, AllFreeKnitting took part in an exciting charity challenge: we knit our very own bear for the Mother Bear Project! I would like to say a big THANK YOU to everyone who knit a bear along with us! 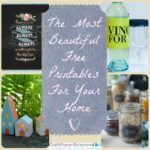 Check out some of our favorite reader submissions below and keep reading … we’ll announce the winner of our promised prize basket below. We like to call him Frankie after Frank Sinatra. He’s classy – after all, just look at this bow tie! Lori Matteson made this bear for the challenge. I love its little face! Georgia Green made this insanely cute pair of bears – Fred and Ethel. I love how she made tiny belt buckles too – how creative! Jill F. Johnson submitted this sweet girly bear. Don’t you love that crazy hair? Teresa Skinner Eagan created this super cute bear. I love the striped dress and matching leggings! Kira Hoskins shared her lovely bear in progress with us. Keep up the great work, Kira. And The Winner Is … Teresa Skinner Eagan!! Teresa, please contact us at your earliest convenience so we can get your mailing address and send you your fabulous prize! Mother Bear Charity Challenge: Where’s My Face? In case you missed it: AllFreeKnitting is participating in an exciting charity challenge: we’re going to knit a bear for the Mother Bear Project and we’d like for you to join us! If you’ve never heard of this organization before, all knit and crochet bears are made with a special pattern provided by the Mother Bear Project. Completed bears are sent to Africa where children affected by HIV/AIDS get to receive your thoughtful donations. Remember, if you send us pictures of your bear (or bear in progress) or post your pictures on our Facebook wall by October 13, you’ll be entered into a contest for free yarn from AllFreeKnitting’s yarn stash. Don’t you love how cute and versatile pom poms are? Add them to the top of a knit hat or to the ends of a homemade scarf and you’ll instantly have a whimsical winter accessory. If you’ve never made your own before and don’t have a special pom pom making kit, don’t worry – making pom poms is actually super easy! 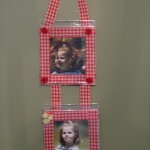 It’s also a great craft project for kids. So get your favorite color of yarn ready and let’s make some pom poms! Take your piece of cardboard or cardstock and cut a rectangle shape that’s roughly three inches wide and five inches long. Take your ball of yarn and wrap it around the middle of the cardboard. Continue wrapping until the yarn protrudes at least an inch out from the cardboard. Depending on how full you want your pom pom to be, you may need to wrap more yarn in this stage. Bend your cardboard rectangle slightly until the wrapped yarn can easily slide off. Your pom pom will look a little disheveled at first. To remedy this, gently pull and stretch both sides of the pom pom to loosen up the freshly cut loops. That’s all there is to it. Enjoy adding your finished pom pom to hats, scarves and more. When I saw this adorable bow headband tutorial by Stephanie from A Common Thread, I knew I had to try to make my own. While I loved the idea of creating a stylish headband from yarn scraps, I also wanted my bow to be more versatile. Wouldn’t it be great if I could transform my bow into a hairclip or a necklace at every fashionable whim? I sure thought so, and so I created my own bow with an open back where either a chain or hairclip can easily be inserted – depending on where my stylish whim takes me. Here’s how I made my version of this fabulous idea! I happened to have some new DK weight yarn that I wanted to try out, so I used that instead of the recommended worsted weight yarn for this tutorial. I also used larger sized needles so my bow would come out light and delicate. Once your rectangle is long enough, BO and weave in the ends. Take some more yarn of the same color and CO 5 stitches. 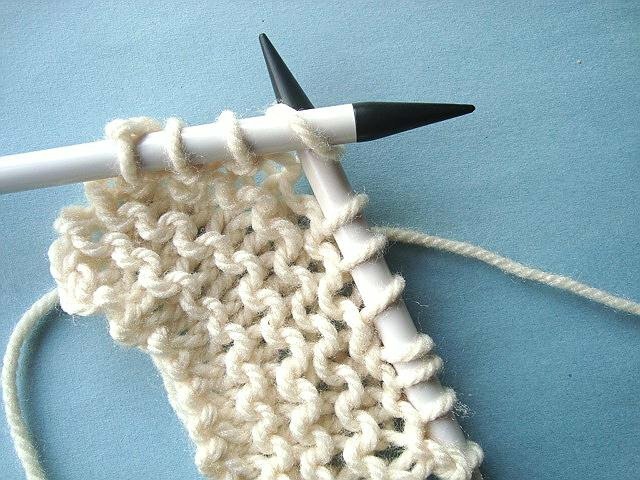 Continue knitting the seed stitch (or whatever stitch you selected for step 2) for every row until your tiny rectangle is three to three and a half inches long. Take your smaller rectangle and wrap it around the middle of the larger rectangle and sew sides together. I also attached the sides of the smaller rectangle to the top of the larger rectangle to increase stability. You’re done! If you want to wear your new bow as a necklace, simply thread a chain through the back of the bow. Want to put it in your hair? Slip a metal hairclip through the back and you’re ready to go. I hope you enjoy! How will you use your bow? Tell us in the comments!